Nacamed, Phoenix Soulutions, NorGenoTech and Clever Health are awarded Innovasjonsrammen for good early-stage innovation and collaboration. Innovasjonsrammen is awarded by Oslo Cancer Cluster with money from Innovation Norway. Congratulations! Important with early financingEarly financing while companies are establishing their business is often limited, but can be crucial to get important projects off the ground. Therefore, Innovation Norway has given Oslo Cancer Cluster 1000 000 NOK to reward excellent innovation and collaboration activity at an early stage. A cluster is all about reaping the benefits of collaboration and Oslo Cancer Cluster has awarded the Innovasjonsrammen-money to four of their promising member companies. Hopefully this will inspire other potential financers to support Norwegian bio businesses at an early stage. 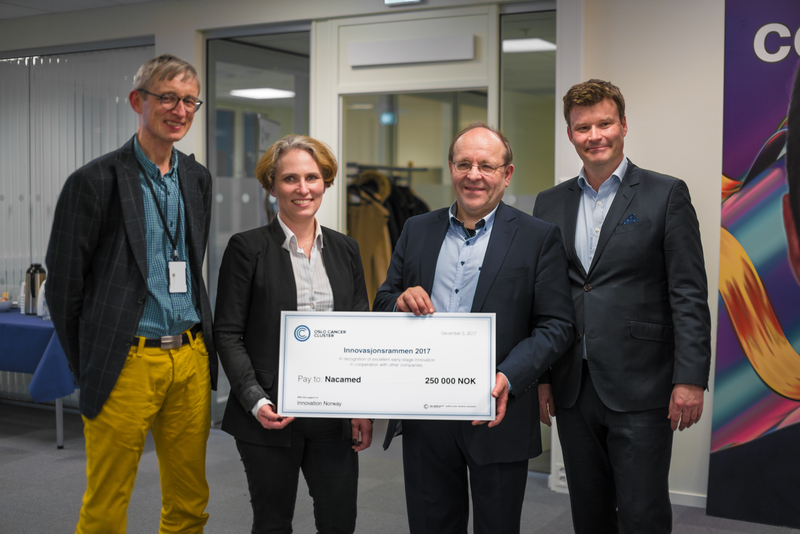 Hanne Mette Kristiansen from Innovation Norway and Ketil Widerberg from Oslo Cancer Cluster, as well as Bjørn Klem form Oslo Cancer Cluster Incubator, handed out checks for Innovasjonsrammen. Her received by Sergey Shaposhnikov from NorGenoTech, Jon-Bendik Thue from Clever Health, Per Christian Sontum from Phoenix Solutions and Christina Westerveld Haug and Lars Gunnar Fledsberg from Nacamed. Bringing Together Tech KnowledgeAt the 5th floor of Oslo Cancer Cluster the four companies each received their innovation award handed out by Hanne Mette Kristiansen from Innovation Norway, Ketil Widerberg from Oslo Cancer Cluster and Bjørn Klem from Oslo cancer Cluster Incubator. Ketil Widerberg, General Manager at Oslo Cancer Cluster, thanked Innovation Norway for providing the money and the panel of experts that helped pick the four deserved winners. – This money helps to remove some risk from the early stages of the innovation process, said Widerberg. Bjørn Klem from Oslo Cancer Cluster Incubator added that it had been a very difficult process choosing the winners from the eight companies that applied. However, giving out prize money requires hard choices and he applauded the versatility at display. –I think it is interesting that the four companies represent four different approaches within cancer research. Four different technologies. And getting them together here today is what Oslo Cancer Cluster and the incubator is all about: Getting different people together sharing knowledge and impulses! Hanne Mette Kristiansen from Innovation Norway explained that Innovasjonsrammen was a way of reaching out to companies that usually avoided their attention. Startups that had not yet attracted any serious business attention, but nevertheless had very promising projects. About the companiesSergey Shaposhnikov from NorGenoTech explained that the money was coming in very handy. They are a company, as he explained it, straight out of the lab. Now they could start turning their research into business. Clever Health has a more customer or patient oriented focus in their business model. Jon-Bendik Thue from Clever Health explained how a widespread disease as prostate cancer needs a way of differentiating between the patients that need treatment and the ones that do not. Per Christian Sontum from Phoenix Solutions was very thankful for the award and money. He showed everybody how ultrasound can be way of targeting cancer cells with precision drug delivery. And the event was elegantly rounded off by Christina Westerveld Haug and Lars Gunnar Fledsberg from Nacamed. Nacamed’s business goal is to produce nanoparticles of silicon material for targeted drug delivery of chemotherapy, radiation therapy and diagnostics to kill cancer cells. She explained that the money would be put in use straight away. Preparing for important trials after Christmas.